A GoodUp research report into the relationship between Corporate Social Responsibility and Employee Engagement. Engaged employees are essential for every business. Many scientific research reports have shown that organisations with motivated workers are more productive, innovative and profitable. These companies have less absenteeism, less employee turnover, and less counterproductive behaviour on the work floor. According to a wide range of customer satisfaction surveys, clients also benefit from engaged employees. In short, increasing employee engagement is crucial for every business. An increasing number of organisations are discovering the power of Corporate Social Responsibility (CSR) to do this. The demand for social responsibility isn’t just coming from politicians, the media or customers, but increasingly from within organisations themselves. Employees, especially those over 55 years old and so-called ‘Millennials’ (the generation born after 1980) want employers to do business in a socially responsible manner. CSR has become a way to attract talent – and to keep it. Increasingly CSR is less of a charitable concern and more of an organisation’s core policy. In this report GoodUp investigates the relationship between companies’ CSR policies and employee engagement. What effect does CSR have on employee motivation? How can companies best design and implement CSR policies to increase employee engagement? And what is best practice in this field? To answer these questions, we began by diving into the piles of scientific research that appeared over the last few years. We interviewed twenty managers at Dutch large corporations, who are involved in the CSR policy, about their employees’ involvement in CSR. The results are presented in this report. Our goal is to inspire companies and assist them to improve their CSR policies and increase employee engagement. An increasing amount of companies use their CSR policies to achieve their organisation’s core objectives. CSR is also a valuable tool for HR departments. While the practical and thematic implementation of a CSR policy varies per organisation, it is possible to sketch a general picture of the way in which CSR can be optimally implemented to increase employee engagement. Below we present ten lessons learned from our investigative consultations and interviews with CSR managers. Customers increasingly demand social responsibility from businesses. CSR is no longer a ‘nice to have’ – it’s a ‘must’. The pressure to embrace corporate responsibility doesn’t come just from external sources (customers, politicians, media) but increasingly from the employees as well. The position of CSR within organisations is shifting from charity towards being an integral part of a company’s sustainable development strategy. Only 38% of Dutch employees feel engaged in their organisation and describe themselves as ‘passionate’ about their work. A high level of employee engagement leads to growth in productivity, loyalty, customer satisfaction and revenue. CSR has a direct relationship to employee engagement. CSR is an increasing factor for employees in deciding whether they want to work for a company, how passionate they are about their job and if they want to stay working there. Combine internal top-down communication campaigns with the input of enthusiastic employees as CSR ambassadors, and give employees the bottom-up communication tools to invite colleagues to join. Voluntary contributions of time, knowledge and talent are the best way to attract the ‘involve me’-generation of employees to actively participate in CSR. Crowdfunding is an excellent CSR tool that regularly leads to high employee engagement and a sense of togetherness and company pride. Don’t make CSR compulsory. Instead encourage employees to become actively involved – and make sure that management supports and actively participates in CSR activities. CSR is becomingly increasingly important for businesses. CSR activities strengthen the value of a brand, influence consumer purchasing behaviour, and can improve the reputation of a business in terms of trust and honesty. In addition, CSR activities improve the atmosphere within an organisation for every stakeholder (Bhattacharya, Korschun & Sen 2009; Luo & Bhattacharya, 2006). 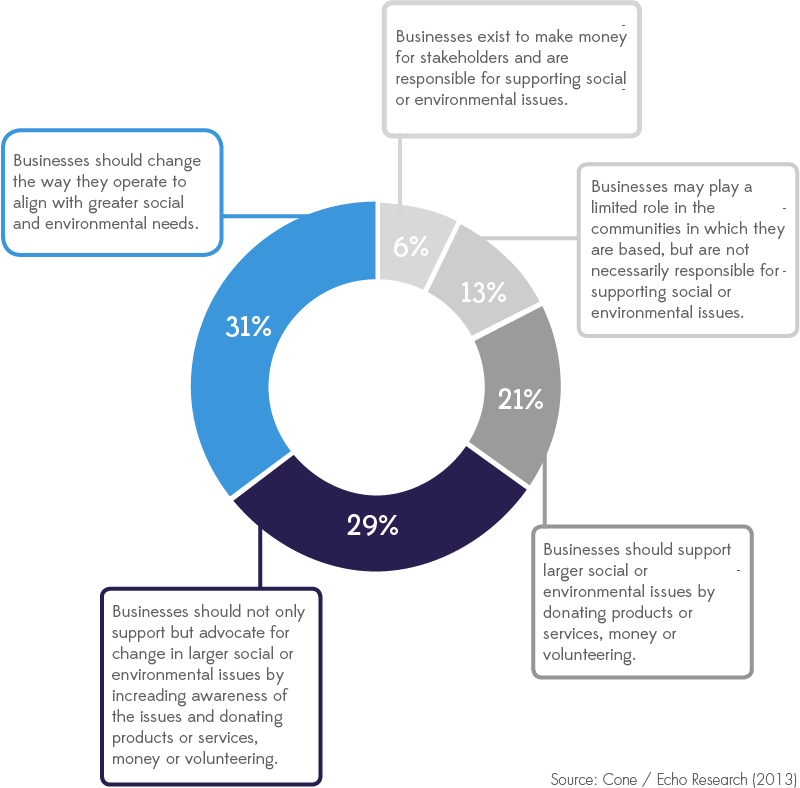 Customers increasingly demand that businesses embrace corporate social responsibility. A global customer survey by Cone Communications & Echo Research in 2013 showed that out of 10,000 customers 91% would switch to a socially responsible business if its price and quality of product/service were the same. Further, consumers have more trust in (94%) and are more loyal to (93%) socially responsible businesses. CSR also influences customer behaviour in regards to where they would like to work (81%), where they would shop or what they would buy (87%) and which products and services they would recommend (85%). While governments and the media highlight and even encourage corporate social responsibility, it’s everyday people in their roles as customer and employee that can exert the most influence. According to research by Cone & Echo, consumers believe that CSR is no longer a ‘nice to have’ for businesses, but a ‘must’. 31% of the consumers are convinced that organizations have to change their businesses to align with greater social and environmental needs. Besides 21% of the consumers believe that organizations should support larger social or environmental issues and 29% thinks business should not only support but also advocate for a change (Cone/ Echo Research 2013). It is no longer a question of whether companies should introduce a CSR policy, but how organisations can create a real and valuable impact with CSR. For many companies CSR is based on the following pillars: sustainable internal processes, responsible production and/or purchasing, responsible employment, trustworthiness, environmental policies, transparency, diversity and community involvement. This report will mainly focus on community involvement & employee engagement. The pressure on businesses to embrace corporate social responsibility doesn’t just come from external sources (customers, politicians and the media) but increasingly from their own staff. Employees want to work on projects within their organisation that contribute to their own personal growth and something bigger than themselves. A survey amongst employees at Booking.com showed that 84% were very interested in actively participating in CSR activities. And research carried out by the American non-profit organisation Net Impact in 2014 showed that at least 45% of American employees are prepared to accept a lower salary in exchange for a job where they can make a social or environmental impact. 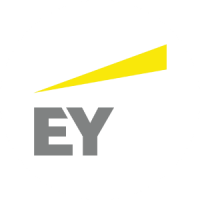 It is particularly noteworthy that Millennials – the youngest part of the workforce, the generation born after 1980 – believe CSR to be very important. As half of the global work force in 2020 will consist of this generation, CSR will become increasingly important for businesses in attracting (and keeping) talent. Research by IBM in 2008 showed that CSR is a determining factor in choosing a business for 50% of Millennials. In addition, 44% would not work for an employer with a poor CSR reputation. While many CSR policies are often described in terms of charity, CSR is increasingly a part of organisations’ core policy. Research conducted by IBM amongst 250 CEOs worldwide showed that 68% have a strategic perspective for CSR – they see CSR as an integral pillar of the sustainable growth strategy for their business. A similar picture emerges from our interviews with Dutch CSR managers. “The time when you could sponsor a charity to show your engagement with society is over,” according to Dirk van den Bogaart at Wehkamp. 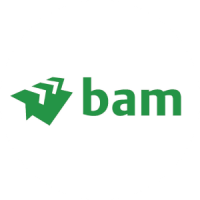 “As a business you need to show that your organisation is genuinely engaged with society. 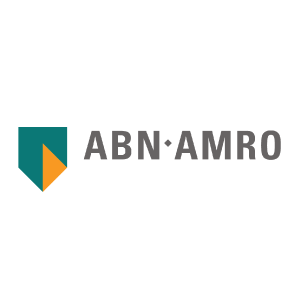 We do this, for example, with responsible production, reducing our CO2 consumption in logistics, but also by protecting the privacy of our online customers.” ABN AMRO has a social program Partner of the Future. This program focuses on people who want to discover and develop their talent. “We hereby give people a ‘nudge’. We do this together with colleagues from (social) sponsorship who are working in the fields of entrepreneurship, education, arts and culture and sports. The activities of employees should contain one of the themes of this social program“, says Inge Postma of ABN AMRO. In line with this approach, more businesses are using their key competencies and skills to support the outside world. If you’re a cacao factory, then it makes more sense to do something with cacao farmers than a hospital”, says Leendert van Bergeijk at TMG. 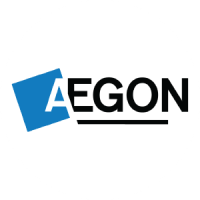 The CSR activities of health insurance firm Menzis, for example, focus not only on the traditional areas but most specifically on health, while Aegon’s employees raise financial awareness. “ARCADIS works in the Shelterprogram with the United Nations (UN Habitat)”, says Niels van Geenhuizen. “After the hurricane in Haiti, we flew our staff in to help and share our knowledge on, for example, waste issues and installing sewers and sanitation”. 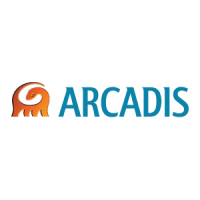 ARCADIS also organises the annual art and technology competition Artcadia at secondary schools where employees share their enthusiasm and expertise with students. These CSR activities form an integral part of ARCADIS’s sustainable growth strategy. 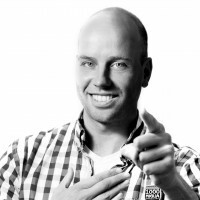 Van Geenhuizen: “We hope that more students will choose to study technology”. Most of our interviews showed that businesses consciously use CSR to increase employee involvement. For example, Delta Lloyd employees regularly help people with debt prevention. 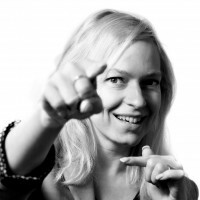 “Often it’s just simple things like opening the post”, says Hester Apeldoorn. “A director who joined in was amazed by what he saw. The amount of letters, the confusion – it really gave him an insight into how serious a situation it can be for some people. This isn’t just about how our employees can help, they also get to see what our clients are really like and how the letters we send can be received”. Also at ABN AMRO they realize that connecting people from two worlds is very valuable. “Encouraging entrepreneurship is core business of the bank. It’s great to see, for example that employees are helping young Dutch designers coach in their entrepreneurship on a voluntary base. In this way, the banker is enriched by the passion and creativity of the designers and the designers discover how important it is to have business knowledge!“ says Inge Postma. If the subject of a CSR policy goes straight for the heart, then employees are more enthusiastic and involved (PWC, 2014). So make sure you choose a subject that employees are interested in. 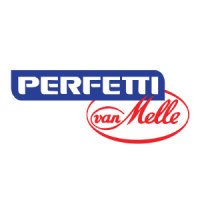 “Projects should be close to home,” says Lieke van Aalten at Perfetti van Melle. 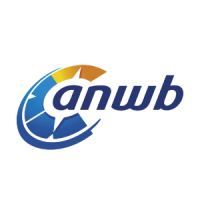 “The closer to home, the more involved employees will be and the more they’ll enjoy it.” A good example is the enthusiasm with which employees of ANWB (the Dutch breakdown service) joined a training scheme to reduce petrol consumption while working. Choose a theme that suits the organisation’s activities, is the conclusion of PWC’s researchers. An extensive research project by Effectory of 400,000 employees in the Netherlands in 2015, showed that at least 81% are satisfied with his or her work. That’s to say these employees are satisfied with the organisation, its offices, the atmosphere at work and the benefits they are offered. Employee satisfaction, commitment and engagement. Wellbeing of employees in their work. This influences their involvement in the organisation, motivation, pleasure in their work and the extent to which they participate in a team. Committed workers care about their organisation. They feel connected to their employer, believe that they fit into the organisation and stand behind its goals. Engaged employees are passionate about their work. They are energised by their work and give everything to do their job the best they can. Research from all over the world focusses on the relationship between employee engagement and company results. This research shows again and again that the higher the level of employee engagement, the more employees contribute to the success of the organisation. Engaged workers do more than is expected of them – their contribution increases by 57% – and there is less chance that they will leave the organisation in the short-term. A PWC report (2014) shows that a higher level of employee engagement leads to increases in productivity, customer satisfaction, loyalty and revenue. 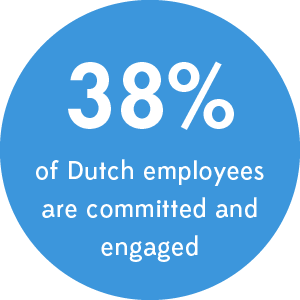 In the Netherlands only 38% of employees feel engaged in the organisation they work for. That means that 62% don’t do their best at work and could actually damage their employer. The consequences of this attitude include negatively influencing colleagues, absenteeism and not serving customers properly. Not only this, research shows that 10-15% of workers who aren’t committed to their organisation plan to leave on short notice. In short: employees who aren’t engaged cost businesses a lot of money every year. An increasing amount of studies show that CSR improves employee commitment (Gross, 2011). It appears that a company’s CSR policy influences employees’ attitudes and is important in attracting, retaining and engaging employees. 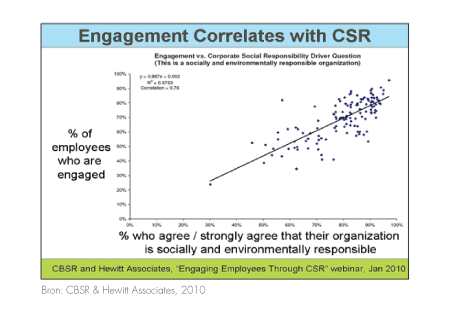 The graph below shows the relationship between employee positivity over their employer’s CSR activity and how proud they are of their company. There is a similarly positive correlation between the CSR policy and employee satisfaction, the intention of staff to remain with an organisation, and their willingness to recommend the organisation to their friends as a good employer. 75% of employees believe that their employer is interested in their wellbeing. CSR also influences how employees view their management. 70% of employees who see their organisation as socially responsible rate the integrity of their senior management higher than employees who are negative about their employee’s CSR policy. Involvement in CSR leads employees to perceive themselves and their employers as caring, resulting in increased employee engagement (Grant, Dutton & Rosso, 2008). After 3 years, more than half of the Booking.com employees are active on the platform and over 500 employee-initiated projects are realised. At Booking.com business and leisure travellers can find and book suitable accommodation all over the world. Since 1996 Booking.com has been available in more than forty languages and currently offers almost 646,779 properties in 212 countries. 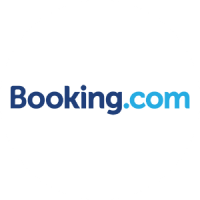 In 2014 Booking.com launched a new CSR programme: Booking Cares. This platform brings employees closer together and encourages them to initiate or support projects that make Booking.com’s travel destinations even more attractive. Employees can start their own project in three areas: sustainable tourism, the environment and cultural heritage – and they can spend a full working day on the project every year. 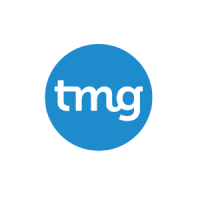 The Booking Cares manager runs the platform together with a team of ambassadors (regular Booking.com employees) spread around the world. All Booking.com’s communication channels (newsletters, Facebook, annual campaigns) are used to share programme updates and successes. After 3 years the Booking Cares program has run, more than half of the Booking.com employees are active in one way or another on the platform and over 500 employee-initiated projects are realised. Their engagement numbers keep growing by 25% a year. How do you generate employee enthusiasm for a CSR programme? And how do you attract the most possible number of employees to join in? A clever communications strategy can play a vital role. However, most companies use internal (online) newsletters, magazines and intranet to raise awareness and visibility of their CSR programmes. Voluntary contributing time, knowledge and talent – also known as crowdsourcing – are currently the most popular way to involve employees in CSR. The ‘involve me’ generation doesn’t want to wait for organisations to become socially responsible – they have their own ideas on how to do this and increasingly want to donate their own time, knowledge and talent to make an active contribution to a better world. Often volunteer work is used to give a company or department day out a socially responsible purpose. 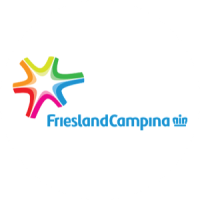 Many businesses support NL Doet (‘The Netherlands Does,’ an annual campaign to work in the community) – in projects like this a business benefits from internal teambuilding, while making a difference in social responsibility in the outside world. The number of days used for volunteering vary by company from eight hours to three days a year. Many businesses put the focus on local partnerships: using the knowledge or skills of employees to benefit the neighbourhood where one of their branches is situated. These contributions allow the business to give back to their local community. For example, service provider companies offer their unique expertise, while production companies offer physical labour. 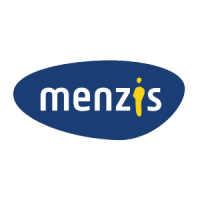 Enexis founded a project called ‘Buurtkracht’ (Neighbourhood Power’), in which local promoters work towards sustainability by working together to save energy. 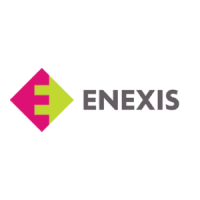 In this way Enexis will help local promotors with knowledge and a good approach to achieve a successful outcome. A useful by-product of this project is that social cohesion in the area has improved too. A lot of the CSR managers we spoke to said that CSR activities are important in demonstrating what a company’s employees can offer to society. More and more organisations are choosing to engage their employees and to make the goals of an organisation more socially conscious. Another popular CSR approach is crowdfunding. The old-fashioned way to raise funds is for an employee to go around the office collecting money for a charity – crowdfunding is a more professional way to achieve the same goal. It’s a proven way to raise funds, and a good way to raise employee engagement. 15 out of the 20 businesses we interviewed have used crowdfunding as part of CSR. 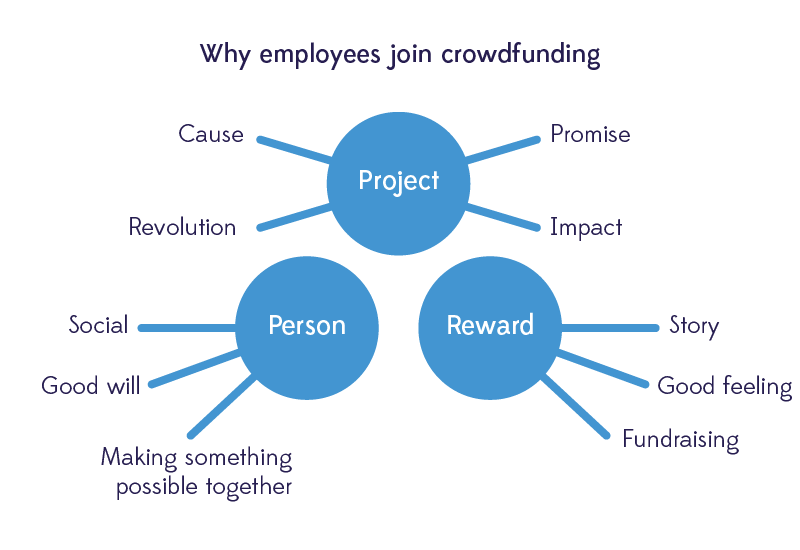 Many businesses have employees who promote projects and look for sponsors via crowdfunding. Often a business will contribute by matching the total funds the employees raise. It’s noteworthy that these projects continue to succeed, and that team spirit amongst employees grows at the same time. Crowdfunding is often used for sporting events, from marathons to joining Steptember, an event where every step taken for a month goes toward charity. The Amsterdam City Swim for ALS Foundation, and running competitions organised by and for KiKa (a Dutch child cancer charity) are popular too. According to most of the CSR managers we interviewed, a successful CSR programme with increased employee engagement begins with a company’s management. “It stands or fails with the support of management and the example given by the management,” according to Niels van Geenhuizen from ARCADIS. “Management has to join in and they will see the added value and supports the program and contributes actively,” confirms Marije van Rhebergen from DLL. At Booking.com the CSR program is originated at the request of the employees who reported that a sound CSR policy of the organisation is important. This is the result of the annual engagement survey. The importance of giving a good example is recognized by the management. Nevertheless, management does play an important role in the success of a CSR programme. A study at the American College of Greece in Athens, Greece, that the credibility of a CSR programme is strengthened when led by a charismatic manager. There’s also less employee cynicism when a charismatic manager supports a CSR activity. 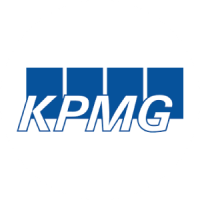 In addition – and of particular relevance to this report – it also increases employee satisfaction at work and their commitment to an organisation. When is a CSR employee engagement programme a success? That depends on the organisation’s goal or the impact a business wants to have. If you judge CSR on the extent to which it improves employee engagement, than the total number of employees who participate is a useful measuring stick. 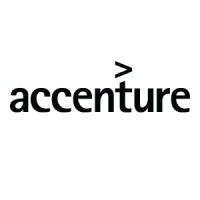 Amongst the companies that we surveyed, an average of 30% of employees took part in CSR activities. A CSR programme should focus initially on just one or two issues. An organisation should set goals, keep to them and keep improving. It’s important that change is seen internally as a long-term process (PWC, 2014). “You should feel that you can say no to requests,” advises Stephanie Brilleman at Van Lanschot. Consistency is important for both an organisation and employees. It’s only when this is in place, CSR can become part of a company’s DNA. Do something that makes it possible to build for the long-term. Start small and build on it. For example, Wehkamp made a conscious decision to support the Dutch chapter of Ronald McDonald House Children Charities. In this report we have investigated the relationship between CSR and employee engagement in organisations. Assuming that engaged employees are vital to a business’s success, we have concentrated on CSR as a way to motive employees and increase employee engagement. While companies were initially pushed by external parties to embrace social responsibility, a move towards CSR is increasingly driven from within organisations. 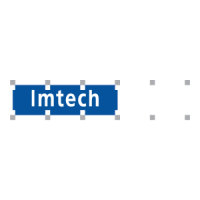 Employees demand it, and management in an increasing amount of organisations are convinced that CSR directly contributes to operating profit by saving costs and improving efficiency. CSR is becoming less of an isolated department within an organisation but increasingly a key part of its core policy. It’s less well-known that CSR can have a positive influence on staff. In this report we have shown through scientific research that CSR is a valuable and smart HR tool. Valuable because CSR leads to higher employee engagement – employees are happier, more motivated and inspired, with less employee turnover. Smart because CSR is a HR dream – companies benefit internally by doing good for others outside the company. While scientific research shows overwhelmingly that CSR is an important tool for raising employee engagement, a surprising small number of companies use CSR to attract, retain and increase employee engagement. This is a missed opportunity, as the better a CSR policy is, the higher the levels of employee engagement and performance are. There is huge potential amongst your employees. People with great ideas and people who want to use their time, money and skills to do something awesome. GoodUp helps organisations to match thinkers and doers via smart, customised platforms. Does your organisation plan to increase employee engagement and make CSR more visible for your employees? Then get in touch with us right away!